One of the most prominent hedge fund bears, Odey, is up more than 50% in 2018, but has a negative 2019 start (ref. FT). We examined Odey's biggest short holdings and looked at Odey's short positions that have been increased or cut so far in 2019.
remaining big shorts: total about £65m. Sector split of the big shorts is more balanced than the country split. Considering number of big Odey's shorts top 3 sectors are: Finance (6 big shorts), Consumer Discretionary (5) and IT (5). 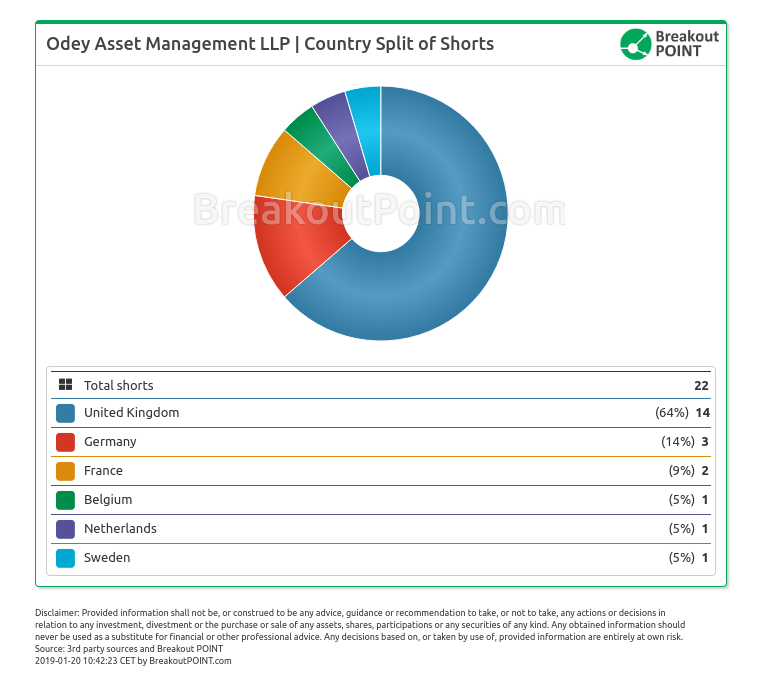 In terms of % size, the biggest Odey's short position remains a 7.44% short in Debenhams. This short has even been increased in 2019 (from 7.21% to 7.44%) and remains, by far, the biggest % short by any hedge fund in all of our European short selling records. Also, a long-term character of some of Odey's big shorts is rather unique compared to other hedge funds. For example, the second biggest % short, a short in Lancashire Holdings, has been continuously in place for more than 5 years, and goes back to September 2013. Eurofins Scientific SE about £46m (stock about +10% YTD). 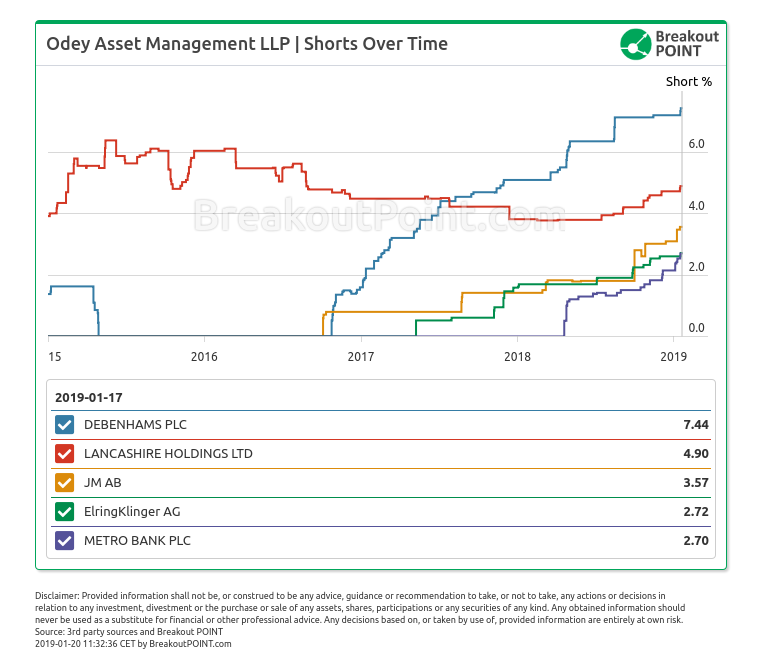 Interestingly, so far in January, and in spite of stock rise, Odey increased Metro Bank short four times (from 2.15% to 2.70%) and holds by far the biggest short in Metro Bank of all hedge funds. The remaining five short holders kept shorts pretty much unchanged. Metro Bank has been on our radar throughout 2018 due to increasing short selling interest. Metro Bank is not the only stock with high short interest that had a sharp rise in 2019. For example, the most shorted EU company in our records, Fugro, is up about 21% YTD and we recorded a number of short holders reducing their shorts in 2019 (Note: big shorts interest went from 20.31% to 16.73% since start of the year). So far in 2019, Odey Asset Managment increased short bets against 11 companies, and decreased three short bets. Short in IG Group was cut four times from 1.27% down to 0.87%, while shorts in ITV and Fresnillo have also been somewhat reduced. Besides above mentioned short increases in Metro Bank and Debenhams, among notable short increases are JM AB (from 3.1% to 3.57%) and Lancashire Holding (from 4.73% to 4.9%). All about Odey's short selling activities is available for our members here. Want to know what big players are short selling across EU? Join Breakout POINT. FAQ | Q: Could you provide more related data and analytics? A: Sure, contact us and we'll try to help as soon as possible. * Note: Presented short selling data is based on European net short position data which is disclosed to the public when short positions at least equal to 0.5% of company issued share capital. Presented data is as of 2018-18-01.